I used to be a student who hated libraries to a great extent. My previous BA programme was based in The Hague, not in Leiden; therefore, I could only go to the small library at Schouwburgstraat (which was the only university library at Campus The Hague) or visit the noisy public libraries in The Hague. The Schouwburgstraat Library was always too crowded; it did not have many books that I wanted to read either. In terms of the public libraries, I did not feel free to leave my books, notes, pens (not to mention bags and electronics) there on the table when I go to the bathroom. And, as I said, they were usually really noisy. For the three years in my BA studies, I chose to study either at home or in the classrooms of our building. After I moved to Leiden, the “passionate hatred” towards libraries was still deeply rooted in my mind. Before last November, I only visited the library once to scan some documents. What completely changed my mind was actually a shocking news that my landlord told me (that was totally irrelevant to studying). I was not aware that my landlord does not cover heating in service charges and I had to pay for my heating costs separately. By then, I had obviously overused my heater that I had to pay more than 150 euros even before winter officially started. I became really upset about staying in my room, and I immediately packed all my study materials and hurried to the nearest library at the Pieter de la Court Gebouw, Wassenaarseweg (the Faculty of Social and Behavioral Sciences Library). To my surprise, when entering the library, my negative emotions instantly went away. There were countless books in the library; the librarians were very nice and friendly. It was so quiet in there. Everyone soaked themselves in the ocean of knowledge. Lockers were located at the entrance and next to the computers, which made my life much easier because I could put my electronics in it. Even if I saw no familiar faces in the library, I felt motivated with so many hard-working people around me. The library was also pretty warm so I decided to study in there everyday from 9 am to 5 pm. In November and December, I achieved a very high level of productivity and saved an incredible amount of money for heating costs. “Double kill”! I have also visited other university libraries like the Law Library and the UB, because they open on weekends as well. Both of them were huge and pretty, but they differ from each other quite a lot as well. For me, the UB is easier to go to because Bus no.1 and Bus no.3 both go directly from Leiden Centraal to the UB (name of the bus stop: Paterstraat); the Law Library requires a bit of extra walking or cycling. As I mentioned in the previous posts, I like modern stuff. The UB has been renovated recently, so it is amazingly clean and very well-equipped. Also, the Café UBé looks quite cute and it has the best fresh mint tea ever. The Law Library was prettier than the UB but I often get myself lost in the giant library. Thank You for your impressions Xueyan Xing! Thomas Wreck MS student at Walden University & Happy NewYear! Truly enjoyed this post. It’s important for students to try out different study spots to figure out what works for them. I would love to post this on our site, http://www.schoolinks.com for our students. Let me know if that is okay with you! Of course, thank you so much for your support! I hope my post would motivate more students to study at the library for the most productivity 🙂 Have a nice day! 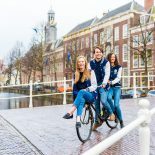 This entry was posted on January 4, 2016 by in Living in Holland, Student Life, Study, Uncategorized, Xueyan and tagged international student, leiden, leiden university, libraries, library, UB, Xueyan Xing.